I've been craving this soup for a few days after having a garlic soup at dinner over the last weekend. 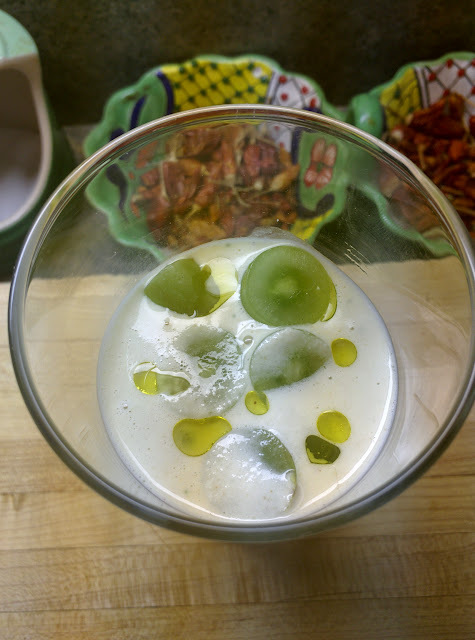 The flavors are very similar except that ajo blanco is served cold. It is usually enjoyed in a glass over ice, maybe with a few grapes and apples floating in it. 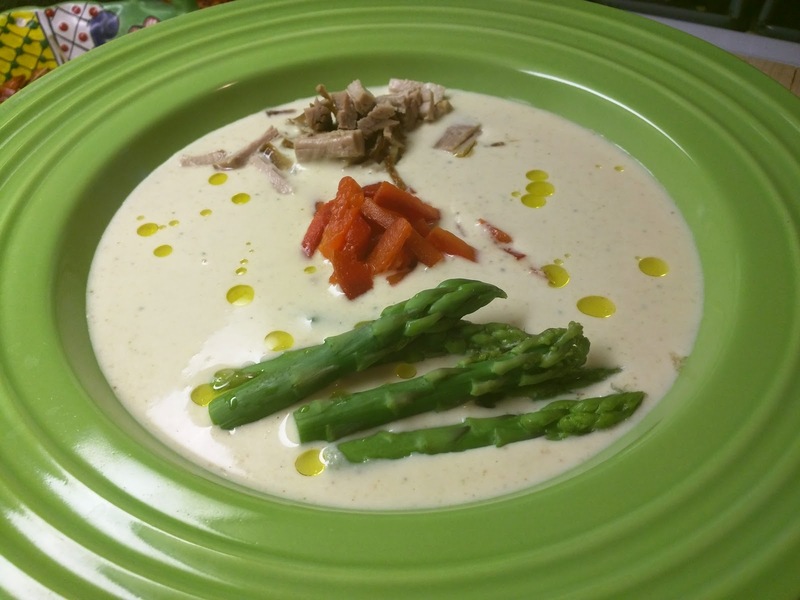 To prepare, I used 200g of peeled slivered almonds and blanched them for about 4 minutes. I removed about have of the cooking liquid and added them to my blender. I roasted 5 garlic cloves (you can use 2 but I like garlic a lot) and added those to the blender as well. I topped this with 8oz of good olive oil, and a tablespoon of apple cider vinegar. I blended until a puree formed, then I ripped off a couple of handfuls of crusty bread (day old is best) and added to the blender along with 12 oz of water. I blended this all together to get it as smooth as possible, adding salt and pepper to taste. That's it, soup is done. To serve I topped with asparagus, red pepper, and carnitas. 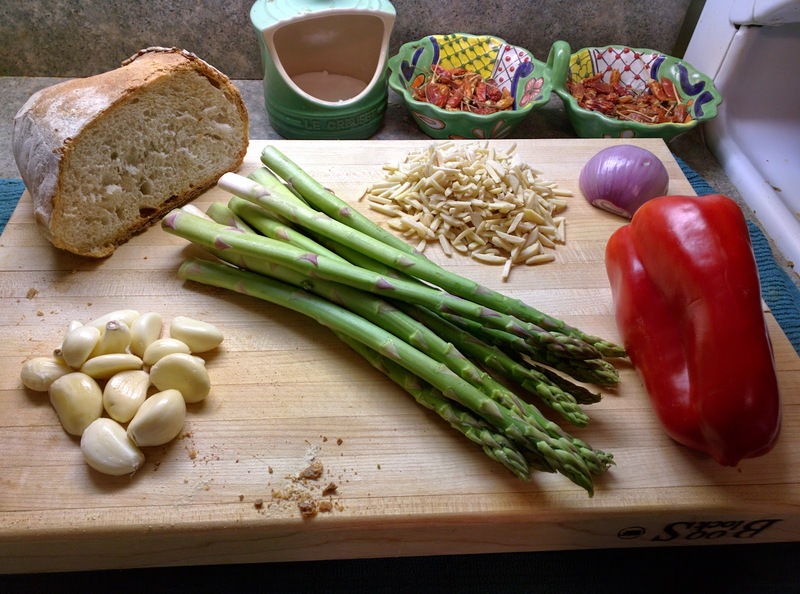 The asparagus was simply blanched and the red pepper I roasted and chopped. The carnitas were already prepared by the butcher and made a great addition to the soup. I finished it with a few drops of olive oil.